Over three decades ago, while he was still serving in the Canadian Armed Forces, Thomas Irvine became a member of the Royal Canadian Legion. 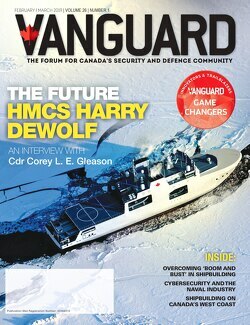 Thomas D. Irvine, Dominion President of the Royal Canadian Legion, was selected as a Game Changer for the October/November 2018 issue of Vanguard. Here is his full interview. What is your role in your organization today? 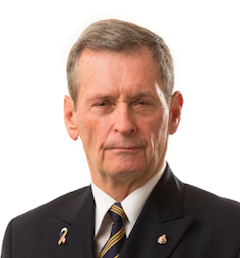 As Dominion President, I must ensure our continued role as a strong advocate for our veterans and communities, as well as our national promotion of remembrance. I am helping to drive increased membership, open to all Canadians, and the modernization of our infrastructure and branch activities to better serve our audiences. I will oversee increased interaction with our government and community partners, to share more about what we do and what our veterans need. I want more Canadians to understand we are not only this country’s largest veteran and community service organization, but we are also the best at what we do – and our assistance doesn’t cost a thing. What was your most challenging moment? My jump from the provincial level to the national level in 2004. I went from chairman of a small Legion Command to the chairman of Dominion Command. I went from running meetings as large as 300 members to those involving 2,000 members. It was overwhelming and truly tested my skills. In many ways it was foundational to the work that was to come – we have 275,000 members across the country and interacting with large crowds is an integral part of my role. What was your “aha!” moment or epiphany that you think will resonate most with our readers? Tell us that story. Many years ago, I attended a Remembrance Day service at a small country branch with maybe ten people present. I recall sitting there listening to people and being shocked that there were so few at the event. I realized they needed help organizing, and in that moment, decided to join the Legion. The following year, there were close to 100 people at the service. It was an important moment for me, a true example of stepping up to make a difference – the epiphany: create the change you want to see. It works. What is the one thing that has you most fired up today? The interconnectivity of modernization and membership. Admittedly, some members of the Legion are living in the past and don’t like change, but we must in order to fulfill our mission. I know that doing things the way we’ve always done them will lead to obsolescence. Many Canadian industries and organizations are facing similar struggles. I want to see us welcome an increasing number of members, both everyday Canadians and today’s veterans. We have so much to offer them. Our 1,400 branches remain a source of comradeship, fun, and assistance. We also have service officers in all our branches who can help veterans (currently serving and retired) access the support they need. At our recent Dominion Convention in August, our members liked some aspects of modernization, such as online membership processing, and this bodes well for the future. The challenge of forging a new path is energizing. What is the best advice you received? When it comes to this organization: listen to your members. As a bottom-up organization, our members are the true decision-makers. I have spent 25 years talking with them and listening directly to their concerns which is a “must do” for leaders of any large organization. Since our branches and Commands are able to initiate change within the Legion, I firmly believe that the best way for us to serve our veterans and our communities is to pay close attention to our base, composed primarily of veterans and their family members. What is a habit that contributes to your success? My organizational skills honed after 23 years in the military, combined with my ability to listen. What people or organizations do you believe best embody the innovation mindset? Innovation often starts at a grassroots level whether in industry, government or at a not-for-profit. Our organization is composed of many thousands of volunteers who come up with great ideas at the local level and they are often the innovators who make things happen. How is your organization changing the game within your area of influence? As Canada’s largest veteran and community service organization, our members carry a lot of weight. We are able to reflect their voices and influence policies at local, regional and national levels. We regularly see the results of our advocacy work reflected in programs, services and benefits for our veterans and their families. We have strong opinions and share them with those in a position to institute change – from advocating for more research into the use of the anti-malarial drug mefloquine and medical marijuana, to calling for a more coordinated and stronger array of actions to improve mental health services. Another example is our continued push for national standards for service dogs. We are also a role model beyond our borders with our day-to-day support of allied veterans in the United States, Mexico, Europe and the Caribbean. What are some of the biggest impediments to innovation in your organization? Age, and the accompanying reluctance to change parts of an important institution that has been around for nearly 100 years. The majority of our members are over 60 years old and are not comfortable with modern online systems, whether computers or social media. Their social interests and views on what defines a veteran are also much different than those of today’s veterans and families. Our hope is that by letting more Canadians know that anyone who supports our mission is welcome to come on board, young and old can work together and learn from one another. What technologies, business models, and trends will drive the biggest changes in your field over the next two years? The world around us is modernizing and we must encourage our branches to go along for the ride. The way we communicate with today’s veterans and families must change and that means becoming a bigger part of the online community – such as with our new online membership portal – and reaching more of today’s veterans before, during and after their service. Refreshing our branch models to cater more to modern interests will also help us drive major change. Take the time to observe closely. Listen to your members, your industry experts and your staff. No single person can run a large organization alone and do it well – teamwork is fundamental. Also, surround yourself with like-minded individuals – those who believe in your vision – to get the job done.